Calling cards are a way to buy voice calling time on a prepaid basis. Calling cards are also known as phone cards. You can use calling cards to make voice calls from any kind of telephone - landline, under contract or prepaid cell phones, payphone, office phones, vacation home phone, etc. You can also use a phone card to make calls to any type of phone. However, surcharges may apply to calls made to certain kinds of phones - mobile phones, in particular. 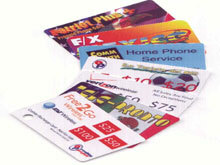 Calling cards work by providing access to the telecommunications network of the phone carrier that backs the card. The voice calls you make using a card are carried over and billed to that phone company's network. Using a calling card involves dialing into the phone network of the carrier using 'access numbers'. Once you enter the necessary account information which tracks your billing information, your call is then routed onto the carrier's network. The calling card carrier then completes the call to your destination over their network. Calling cards may be bought directly from the issuing calling card carrier or from a wide range of distribution and retail intermediaries. Places where cards can be bought include many types of retail stores and a variety of online retailers. Cards are also often packaged specifically for companies and other organizations and given away as perks. Calling cards can be purchased in two forms, but they both work the same. Physical cards that look like a credit card or gift card. These are generally sold in retail stores. Virtual cards that are sold online. Calling cards can be used to make calls between any two locations anywhere in the world. Though they can be used for local calls, most people use calling cards for long distance calls - either long distance domestic calls or long distance international calls. Calling cards are priced in many different ways - every card and card company has its own pricing scheme. These pricing schemes can get very confusing very quickly. One thing that all calling cards have is an advertised per minute rate which specifies the per minute cost for a call between any two locations (the origination and destination locations). The applicable per minute rate will vary depending on the the specific locations involved - e.g., USA to India, or UK to Brazil, etc. The rate differences can be very significant. And a company may have very favorable rates for certain routes, but very bad rates for others. Per minute rates can also vary based on the type of phone being called - e.g., rates to call mobiles are often higher, calls to satellite phones are definitely higher. When shopping, be aware that per minute rates can not only vary significantly between vendors, but also between cards from the same vendor. That means you need to look carefully at the pricing for each card you are interested in. In addition to per minute rates, many companies charge extra fees and surcharges that get added on top of the per minute rates. These extra fees can dramatically increase the advertised per minute rate - sometimes doubling or tripling the advertised per minute rate of a card! As you shop for a card, you should look carefully to see which of these pricing mechanisms apply and how they might increase the advertised per minute rates. Click here for more information on calling card pricing. Not surprisingly with all these confusing fees, there is a lot of funny business that goes on in marketing calling cards to the point that calling card fraud has become a major problem. The problem is large enough to warrant action by Federal and State authorities in the US and elsewhere worldwide. At least in the US, these actions have led to improved fee disclosures and less aggressive marketing practices. You can use calling cards to make voice calls from any kind of telephone - landline, mobile, payphone, office phones, vacation home phone, etc. You can also use a phone card to make calls to any type of phone. However, surcharges may apply to calls made to certain kinds of phones - mobile phones, in particular.